New GA 400 Exit on Kimball Bridge Road? Over the weekend Alpharetta City Council Candidate Ben Burnett invited me to an event hosted by residents along Kimball Bridge Road. For more than an hour the residents shared many questions and comments about a number of concerns but the hottest topic of conversation was traffic along the Kimball Bridge corridor. As many of you may recall the voters of Alpharetta approved a municipal bond project which included road and intersection improvements for the stretch of Kimball Bridge Road between Waters Road and Northpoint Parkway. We talked about those plans and discussed the neighborhood concerns about adding a roundabout where the red light at New Prospect Elementary School is now. Neighbors also brought up the topic of developments along Northwinds Parkway and Kimball Bridge Road west of GA 400. So Ben and I explained the plans for road improvements being discussed with the Georgia Department of Transportation as part of the TSPLOST project list. You can find the full list of those projects here. And as we discussed proposed road improvements for the west side of Kimball Bridge Road it became apparent none of the residents along Kimball Bridge Road had any idea that the Georgia Department of Transportation plans to replace their bridge over GA 400 with one that will include on and off ramps for managed toll lanes onto Kimball Bridge. In fact the residents in attendance were shocked. So I explained that Alpharetta’s Director of Engineering and Public Works had presented plans for the exits to our mayor and council during a public workshop in May. Then I encouraged residents along Kimball Bridge Road to start paying close attention to the Department of Transportation plans because the work is expected to begin in 2020 and if they wait much longer it could be too late. For those of you not familiar with the Georgia Department of Transportation’s Managed Lane Program for the GA 400 corridor you can read more on their website here. You can also watch video of the public presentation we received at our May 22nd meeting on the Alpharetta city website here. If you follow that link and click on the agenda item number 10 below the video it will skip to the Kimball Bridge discussion which began at the 2:51:30 point of the video. These days there are so many changes taking place in Alpharetta it is nearly impossible for our residents to keep up. And it could have been a real mess if the families most impacted by toll lane exits on Kimball Bridge Road had not found out until it was too late. Neighborhood meetings are a great way to keep the lines of communication open between council members and our constituents. I am glad to know Mr. Burnett appreciates that. Below is the agenda for tonight’s Alpharetta City Council meeting. The meeting will take place at Alpharetta City Hall at 6:30 p.m. If you would like to watch the meeting from your computer you can find it at this link. The first item of business will be the appointment of Alpharetta’s next Director of Public Safety and immediately after that there will be a short recess to allow members of council, fellow employees and members of the public to welcome the new Director aboard. Current Director of Public Safety Gary George has done an incredible job of building our Public Safety Department into one of the finest in the nation and our new director will need the continued support of our community to maintain that tradition. I invite all of you to come out tonight for this important occasion. Consideration of text amendments to the Unified Development Code including Spa Services, North Point Activity Center Guidelines, as well as other amendments. Is The Current MARTA Vision Worth The Chase? The article below was written by Mayor David Belle Isle, the mayor of Alpharetta, who gave me permission to share it with you here. Last week, I found myself in a makeshift room midway up the interior back stairs of the State Capitol. The room was packed. The air was hot. I was there to testify on behalf of Alpharetta at a committee hearing on the proposed MARTA expansion bill, SB 330. To my surprise, the room was not full of concerned every day citizens seeking faster commute times to home and work. Rather, it was filled with developers, lobbyists, and employees of chamber and public policy groups. Indeed, a total of 7 lobbying firms have been retained to make sure this MARTA bill gets passed and that you vote for it. Big money. Big stakes. Big supporters. Among others, two developers spoke of how wonderful the MARTA expansion would be for the economy, specifically their economy. They introduced a new phrase: “transit premium.” This is the concept by which the properties serviced by the rail will increase in value by 50%. This is fantastic! Fantastic, that is, if you’re a property owner or developer near a proposed new transit station. What About the 97%ers? Only 3% of commuters within reach of the current rail use MARTA and ridership is down over the past 10 years. Convenience Factor. For most, using rail involves a six-part process: a drive to the station, a wait for the train, a ride on the rail, a wait for a bus, a ride to a bus stop, and a walk to their building. Real people will weigh that time and hassle against driving straight to work. Transit for Everyone… Else. Many who support the expansion of MARTA rail are laboring under the hope that others will take the train so that their drive downtown won’t take so long. Until Death Do It Tax. 43 years is a long time to pay a tax on everything you purchase. This puts the full payment outside my life expectancy. I’m 40. Bait and Switch. The MARTA project list is disposable. MARTA is not obligated to build the projects the voters are being asked to fund. They should be. Hadn’t Thought of That. No one has thought to measure the expected improvement, if any, along Georgia 400. For an informed vote, we need to know how much quicker our drives will be. Federal Match? The proposed expansion is dependent on federal matching funds of $4 Billion. There is no obligation by the Fed to commit these funds. Before MARTA expansion hits a ballot, there should be. I’m Against What? The ballot question is worded in a way that a “No” vote implies you oppose traffic relief and economic development. The question should be neutral. Stacked Deck for Alpharetta. If successful, 3 new transit stations will attract 3 new streams of traffic from surrounding areas and require 3 new 2,500-car parking decks constructed MARTA-style. I truly want to see us, as a region, take on traffic and develop a comprehensive plan. I can see it. That’s my vision. It is imprinted on my mind. Yet, we need to look at all the options openly: heavy rail, new roads, light rail, additional lanes, bus-rapid-transit, managed lanes, bus circulator programs, intersection improvements, signal timing, adaptive traffic, Uber, driverless cars. If we’re not careful, we’ll spend more than half of our transportation dollars on 3% of our commuters. “What could be” will be no better than “what is,” except we’ll have the pleasure of paying for “what should never have been.” The best answer probably lies in some combination of travel methods. We don’t know. But before we vote, let’s find out if this vision is worth the chase. Last night the Alpharetta Mayor and City Council unanimously supported a resolution asking members of the Georgia state legislature to allow Fulton County to finish the transportation improvement process begun last year under House Bill 170. It is my understanding that the Mayor and City Council of Johns Creek have also adopted this resolution. Last year’s House Bill 170 laid out a well designed plan for investing in the diverse infrastructure needs of a county the size of Fulton. The resolution below would preserve that ongoing process while still providing municipalities more flexibility to expand transit within that framework as needed. You can click on the photo below to read the whole thing. For months Fulton County mayors have been meeting to negotiate an agreement regarding a transportation sales tax which was authorized in House Bill 170 passed by the Georgia legislature in 2015. Below is a press release issued today by Alpharetta Mayor David Belle Isle regarding the matter. I support our Mayor’s critical approach to an issue that is vital to the future of our region and our state. I am proud to serve with a man who has the courage to stand up for what we both know is right regardless of which way the prevailing political winds may be blowing. You can click below to view the whole statement. Supporters of Georgia State Senator Brandon Beach’s MARTA tax increase bill, SB 313, have made many claims about public support for the legislation. As an elected representative of 63,000 people who live in Alpharetta I know many of those claims are inconsistent with the truth. 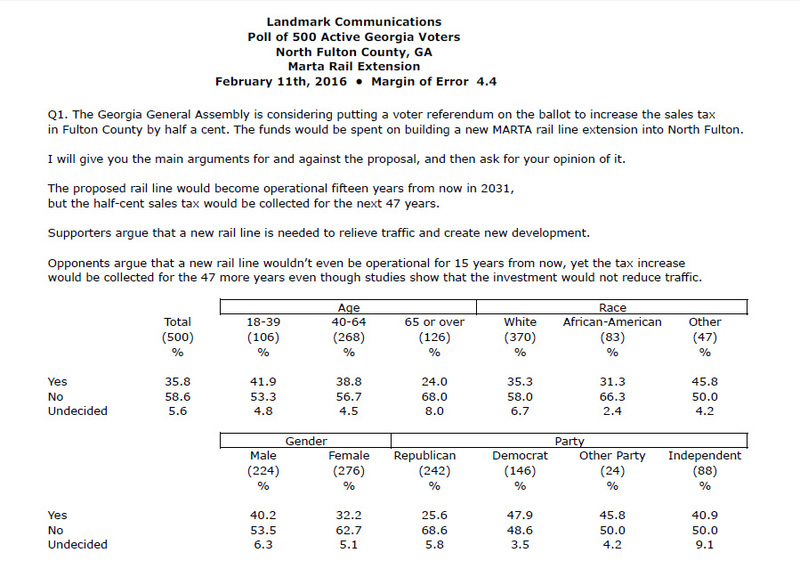 That is why I am pleased to release the findings of an objective, statistically valid poll which demonstrates the people of North Fulton overwhelmingly oppose such a tax increase for the purpose of extending heavy rail in the region. Voters in the 5 major cities of North Fulton county have spoken and oppose a massive tax increase to support a Marta heavy rail extension. When presented with a reasonable and accurate set of facts, the poll showed a clear landslide rebuttal. Women opposed the tax increase and rail line by almost 63% and Republicans by almost 69%. Democrats also opposed by a slim majority and African-Americans opposed by over 66%. All age demographics were a majority against the tax increase and rail line. The poll was conducted by Landmark Communications a respected, non-biased firm.